Ramesh brings to Digité over 30 years of rich experience as an academician, entrepreneur and technologist. Ramesh is a pioneer in the field of Artificial Intelligence and its application to medicine and has served on the faculty of Computer Science at MIT and University of Southern California, Information Sciences Institute. In 1997, Ramesh was lured into entrepreneurship and joined Rightworks; a provider of B2B e-business applications. Ramesh served as the CTO from its inception till the year 2000 when the company was bought over by i2 Technologies. At i2, Ramesh was VP Technology and Technology Strategy till 2004. Ramesh holds a bachelor’s degree in Electronics Engineering from Indian Institute of Technology (IIT) Kharagpur, a master’s degree from IIT Kanpur and a Ph.D in Computer Sciences from Massachusetts Institute of Technology. 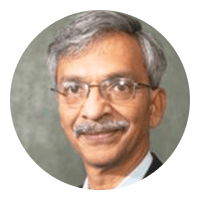 He is also a fellow of the American Association for Artificial Intelligence (AAAI) and American College of Medical Informatics (ACMI) and was the Editor-in-Chief of AI Magazine from 1991-96.